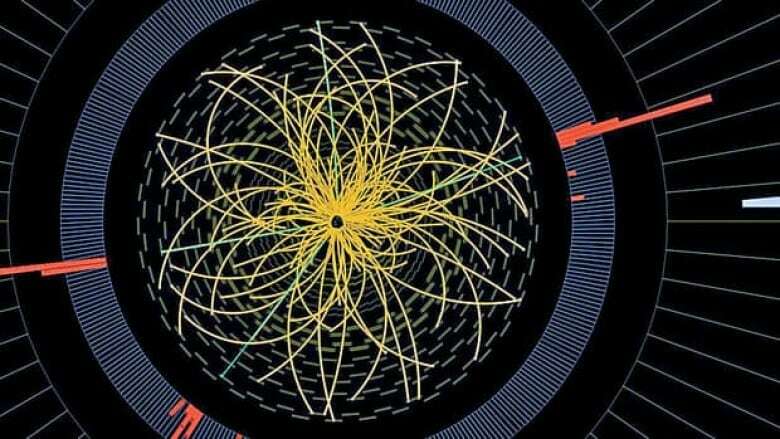 The probable discovery of the long-sought Higgs boson particle won't have an instant impact on everyday life, but scientists see great potential in what it might lead to in years to come. In the world of science, the excitement doesn't mount much higher than the frenzy Wednesday around the announcement that scientists at the world's biggest atom smasher may have found the "God particle." The discovery is called a boson, a class of sub-atomic particle, but the description stopped just short of confirming that it's the long-sought Higgs boson particle. While there are still questions to ask and research to do to confirm if it is indeed the Higgs boson, physicists see massive implications to the discovery. "It's helping us understand the big universal question, which is what are we made out of," says Philippe Di Stefano, a physics professor at Queen's University in Kingston, Ont. The discovery won't have an instant impact on everyday life, but scientists see great potential in what it might lead to in years to come. "This is not going to be able to give us a solution for the energy problem or climate warming or the other, the immediate, pressing problems that face us," says Pekka Sinervo, a physics professor at the University of Toronto. "It is, however, a piece of the puzzle that we need … to understand the world." Sinervo likens the accomplishments of the scientists behind Wednesday's announcement to what physicists and scientists were doing in the 1930s to understand quantum mechanics and the nucleus of an atom. "No one at that time knew what the potential benefits or uses of that knowledge would be." Here's a look at some reasons the discovery announced Wednesday is seen as so vital. "To me, the takeaway message is that we seem to be closing a chapter on the last decades of particle physics, and we're entering a new era of examining the properties, and we hope very much to push beyond the standard model. We're really at a crossroads now. "It’s an indication that the last 45 years of particle physics has been on the right track, and now we hope to look beyond the standard model into why particles gain mass. This may be observations of supersymmetry, other dimensions, [and other] theories that were developed to go beyond the Higgs boson." "Without the Higgs particle, other particles, such as electrons and quarks, would be massless and the universe would not be what it is. "Now, with the amazing results from the [Large Hadron Collider], we are finally finding growing experimental evidence that the Higgs really exists. "The second part of the story about the Higgs particle is even more exciting as it provides us with a window to new physics — a tool for the exploration of the truly unknown. "The next stage will be a detailed and careful study of its properties. Successful completion of this second stage will bring us closer to uncovering new physics, explaining dark matter and other mysteries of the universe." "This discovery is certainly basically fundamental research. In fundamental research, there are no guarantees that there will be direct and immediate applications to everyday life. "However, fundamental research has turned out a huge number of things that are relevant for everyday life.… For instance, in the 1930s, Carl Anderson discovered anti-matter, and now anti-matter plays a very very large role in positron emission tomography (PET), and PET scans are really widely used nowadays in medicine, so this is a very important application to the lives of many many people." — Philippe Di Stefano, physics professor at Queen's University in Kingston, Ont. "Today's discovery teaches us something fundamental about the building blocks of the universe and how the fundamental particles that build the world around us acquire mass. "The Higgs boson matters because it tells us about 'matter.' This is curiosity-driven research and addresses basic questions about the evolution of the universe. "In addition, this curiosity-driven research also leads to many important applications. It was exciting to see how today's seminar at CERN [the European organization for nuclear research] was broadcast via the World Wide Web to all continents, using the technology pioneered at CERN. Particle accelerators have many applications in material science and medicine." "Up till now, we've had this model that has been pretty successful, but this one missing piece had been there now for over 20 years, close to 30 years. There were actually two pieces missing when the model was first put together over 30 years ago. The first one [the top quark] was discovered … about 17 years ago. "It's a little bit like saying we now know that Pluto isn't a planet any longer because we've learned a lot about how planets behave and what the nature of planet really is. The astronomers have said Pluto doesn't really qualify any longer. "So it changes the textbooks and it certainly changes in Grade 11 and Grade 12 physics when people talk about the fundamental particles, we can now say, assuming this is the standard model Higgs boson, that the Higgs boson has also been observed. And that in a certain sense … completes a picture that we get from the standard model." "It's impossible to avoid the conclusion we've discovered a new particle. The chance of either of these experiments being wrong is less than one in a million, and for both of them to be wrong is more like one in a trillion. We can safely conclude something new is there. Now the question is what exactly is it? "All the evidence suggests it's the Higgs boson, but the results released today just aren’t strong enough to conclude that it is the Higgs. You have to show that it looks like a duck, waddles like a duck, and quacks like a duck before you can say it's a duck. "It's been an extraordinarily long haul. Some of us have been involved in this since the early '80s. That’s a 30-year journey. Personally, I've been involved in this chase for 25 years. The results today are one of the stronger forms of delayed gratification." NOTE: Several of the comments above were gathered by the Science Media Centre of Canada. Dislike 'God particle?' What nickname would you give the Higgs boson?